A retinal oncologist (an eye cancer specialist) can determine if you have an eye cancer by performing a complete clinical examination. The examination may include asking questions about your medical history, examining both eyes, looking into the eye at the tumor, doing an ultrasound examination, and obtaining specialized photographs. 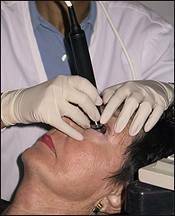 Biopsy, which is often indicated to diagnose tumors in other parts of the body, is rarely needed with eye cancer. Though occasionally necessary, biopsies are usually avoided because they require opening the eye which risks spreading of the tumor cells. Your ophthalmologist may be able to recognize an eye cancer by its appearance, including the degree of pigmentation of the tumor, its shape and location, and by other features. Unlike tumors in other parts of the body, many eye cancers, including choroidal melanoma, may be directly visible through the "window" provided by the pupil. During an ultrasound examination, sound waves are directed towards the tumor by a small probe placed on the eye. The patterns made by reflection of the sound waves helps to confirm that tumors are present. Ultrasound can determine if there is extraocular involvement (if the tumor has spread outside the eye) and helps to determine the thickness or height of the tumor. Black and white pictures of the ultrasound images may be taken for your physician to review. (Above) The ultrasound examination helps the ophthalmologist diagnose and measure ocular tumors. There are two types of special photographs ophthalmologists use to assist in diagnosis: fluorescein angiography and fundus photographs. In fluorescein angiography, a special dye is injected into a vein in the arm. As the dye passes through the blood vessels in the back of the eye, this allows for a view of the circulation of the retina and the layers beneath the retina, highlighting any abnormalities. Although fluorescein angiography is not diagnostic, it is useful to exclude other possible disorders. The fundus of the eye includes the retina, macula, fovea, optic disc and retinal vessels. In fundus photography, the inner lining of the eye is photographed with specially designed cameras through the dilated pupil. This is a non-invasive and painless procedure that produces a sharp view of the retina, the optic nerve and the retinal vessels. Your doctor may request that you have a complete physical examination and specific tests depending upon what he sees inside your eye. Tests may include magnetic resonance imaging (MRI), a computerized tomography (CT) scan, chest x-ray, and complete blood count. A Computerized Tomography (CT) scan involves a series of X-ray images that provide a very clear picture of the eyes, the surrounding tissue and the brain. Unlike an ordinary X-ray machine, which takes one picture at a time, the scanner takes a number of small pictures as it rotates around the patient. Magnetic Resonance Imaging (MRI) uses magnetic fields and radio waves linked to a computer to create pictures of areas inside the body. Because MRI can "see" through bone, it can provide clearer pictures of tumor located near bone and in the orbit.